ClamXav’s two-pronged approach helps it do as well a job as it does. The program allows you to put infected files aside in a specified quarantine location, then tear them and delete them as you see fit following the scan. This is where ClamXav 2, a free application developed by Sourcefire VRT, becomes the greatest thing ever. Lovingly developed and religiously updated by the group of open source developers responsible for the cross-platform ClamAV anti-malware application, ClamXav won't actively scan incoming downloaded files the way commercial anti-malware suites will, but it does a great job of combing through your user account, your hard drive, or more specific folders as needed. If there are files that are infected on your Mac, ClamXav will find them, provide you with a description as to what the infected file can possibly do to your computer, and give you tools to deal with them. ClamXav's two-pronged approach helps it do as well a job as it does. The program allows you to put infected files aside in a specified quarantine location, then tear them and delete them as you see fit following the scan. The scan process, in turn, can be paused and resumed at your leisure (something which is definitely appreciated in the case of multi-terabyte hard drives), and infected files can be quarantined and/or deleted outright on the fly. It's simple to schedule scans or add a flash drive or external hard disk to the device list to scan later. What makes ClamXav truly shine is its support base, as well as the fact that it doesn't try to be overbearing within the OS X operating system, nor does it try to function without your permission and solve all your problems. Unlike offerings like Symantec's recent anti-virus and security suites, ClamXav doesn't try to be ever-present and continuously monitor your system functions. It's there when it needs to be, its application and virus definition update functions work like a dream, and after having to remove an unresponsive 2009 copy of Norton Antivirus out of a client's MacBook Pro using a shell script located on the Symantec website, one can appreciate the effort that goes into its steady upkeep. ClamXav doesn't promise to police your downloads, act as a firewall, keep your kids from adult content, or solve all your problems. Instead, it lets you isolate and delete the assorted viruses, malware, and trojans that could be causing your Mac to behave erratically. 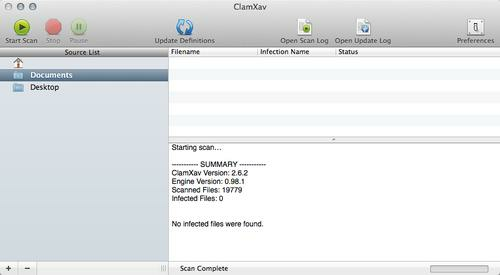 ClamXav is updated on a daily basis by a group of incredibly talented security engineers and distributed for free. ClamXav requires an Intel-based Mac running Mac OS X 10.6 or later and can be downloaded from the ClamXav website or from the Mac App Store. It may not be the be-all and end-all for every virus-related issue you'll see on your or your clients' Macs, it's easy to install, easy to configure, and a great place to start the diagnosis and repair process.